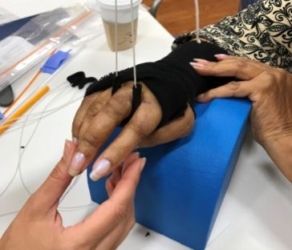 Patients with severe Rheumatoid Arthritis may have significant ulnar drift of the digits which greatly interferes with their day-to-day activities. 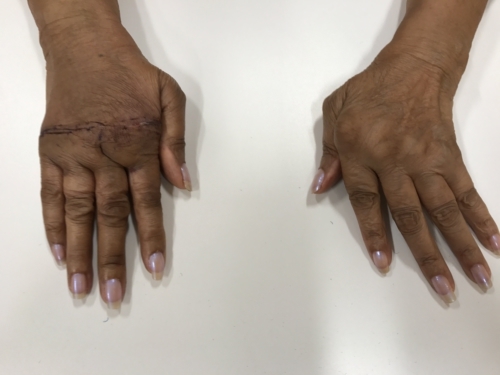 MCP arthroplasty is a procedure that may help realign the fingers to allow for improved function. 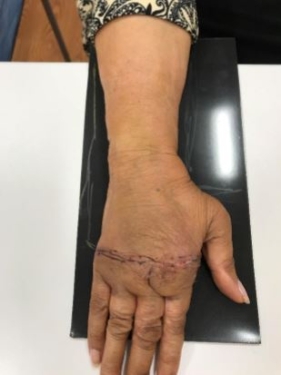 Indications for the surgery are volar subluxation and dislocation of the MCP joints with significant ulnar drift of the digits. 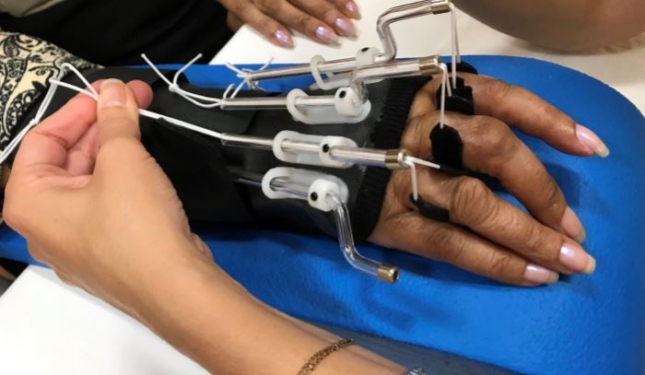 The goals of this surgery are to provide pain relief and to improve functional outcomes by realignment of the digits and correction of the ulnar drift and the extension deficits. 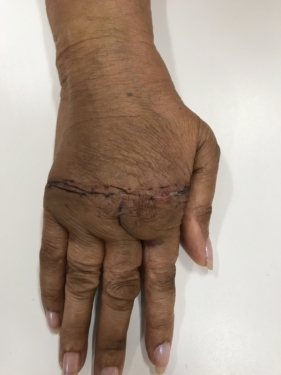 After removal of the metacarpal heads, the MCP joints are replaced by implants (usually made from silicone) with stems placed in the corresponding metacarpal and proximal phalanx. The implants help with correction of the deformity and allow for improved flexion and extension at the MCP joints. Post-operatively the MCP joints are positioned in extension for about two weeks before any active therapy programme begins. 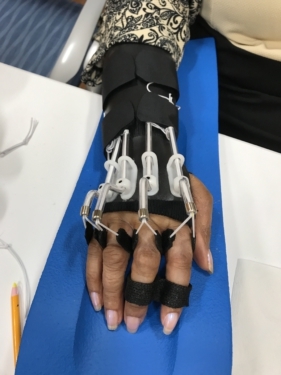 After suture removal, a thermoplastic orthosis is fabricated on the dorsal wrist and forearm and dynamic outriggers are created to support the MCP joints in extension while allowing for active MCP joint flexion. Care must be taken to create the proper angle of pull on the MCP joints. It may be necessary or recommended to add a radial based pull to counteract the deforming forces. 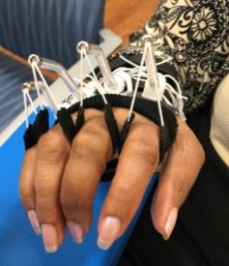 The orthosis is to be worn for 4-6 weeks as the patient regains active motion in the fingers. Create support for the MCP joints in extension. 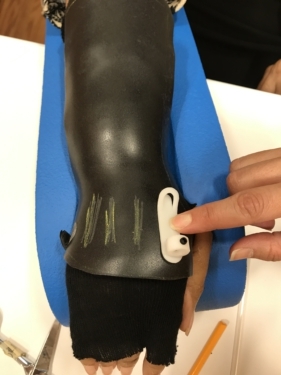 Allow for active MCP joint flexion. Create a proper angle of pull on MCP joints. Ad radial based pull to counteract deforming forces (if needed). 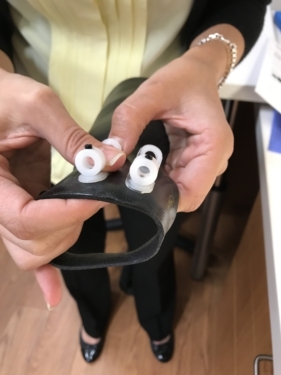 Orfit has excellent solutions for post-operative MCP arthroplasties with Dynasyst and our Orfitubes and Orfitube adjusters. 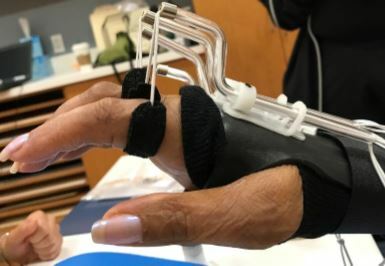 I recently had the opportunity to assist with fabrication of this orthosis for a patient seen post MCP Arthroplasty at a clinic in New York City (U.S.). 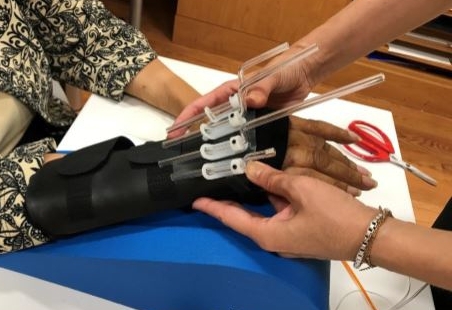 The thermoplastic base orthosis can easily be fabricated from a variety of different materials. I prefer the properties of Orfilight, Orfilight Black NS and Orfilight Atomic Blue NS (3.2mm / 1/8”) as these materials are highly conforming, yet lightweight and comfortable. 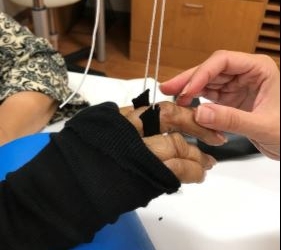 The Orfitube adjusters are placed in alignment with the metacarpal bones on the dorsum of the hand. 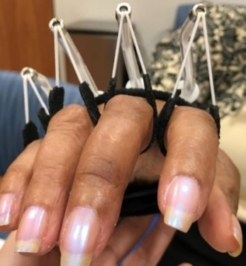 The Orfitubes (plastic and not to be heated) can be cut to an appropriate length and bent easily to make low profile outriggers, one for each finger (Keep the rod inside while bending). The end caps are placed on the distal end of the Orfitube to prevent shearing forces on the elastic thread and they offer a finished and modern look. The individual custom finger cuffs can be made from Orficast (3cm/1”). Activate a 2-3 inch (5 – 7,5 cm) piece of Orficast and lay the elastic thread near the bottom edge. Fold over the material so the thread is in the middle and mould around each finger’s proximal phalanx. Do not place the elastic thread into the fold, as this creates a lopsided support. Patient seen 10 days post-surgery. Notice severe ulnar drift on the right, with realigned fingers on the left. 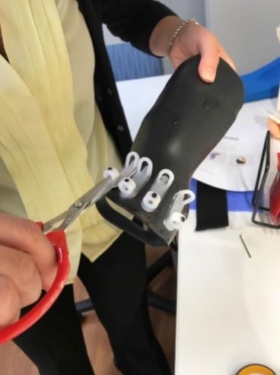 Making the pattern for the dorsal wrist orthosis and marking the placement of the adjusters over the metacarpals. Attaching the Orfitube adjusters to the base orthosis with dry heat. 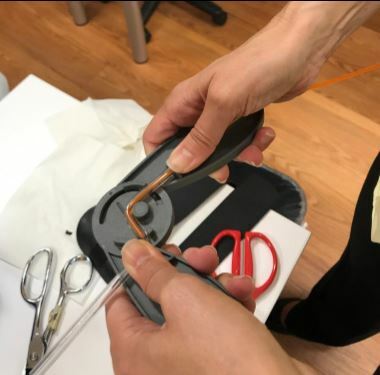 Attaching the Velcro straps and making individual finger cuffs with Orficast and the embedded thread. 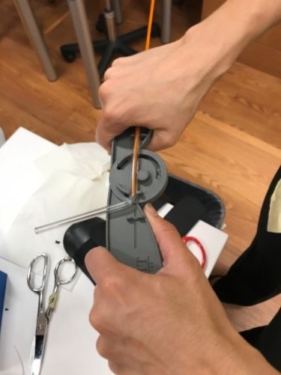 Bending the Orfitube with the nylon rod inside with the bending tool. Lining up all four adjusters with Orfitubes. Checking placement and length of Orfitubes. 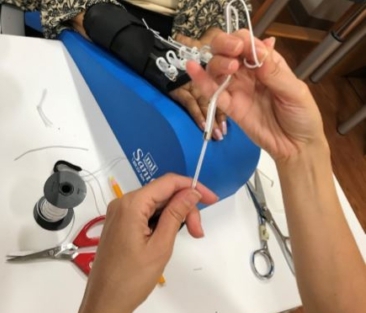 Threading elastic thread through the Orfitubes. Check alignment from all angles. 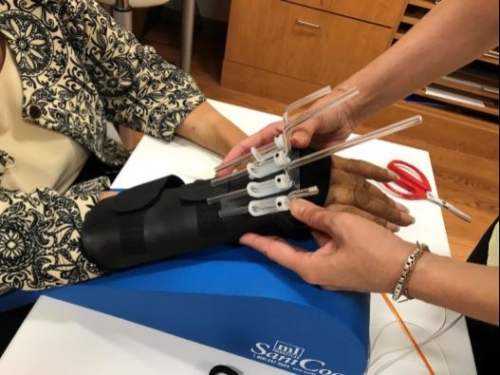 The completed orthosis can be adjusted for increased radial pull as needed. 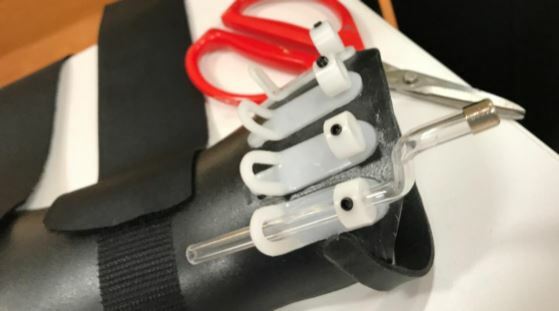 We added an Orficast buddy strap between the index and middle finger to help prevent rotation and overlapping of the fingers. 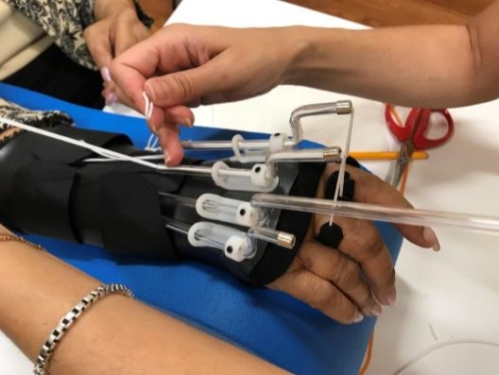 A recently published biomechanical study in the Journal of Hand Therapy looks at immobilization of the partially torn or repaired ulnar collateral ligament of the thumb.